Telly favourite Peppa Pig is bringing all her family and friends out to play in a new stage show. Enjoy interactive fun and games, sing-a-long songs and life-size puppets in Peppa Pig’s Surprise, at Sheffield Lyceum on September 9 and 10. Performances are at 4.30pm on Friday and at 10am, 1pm and 4pm on Saturday. 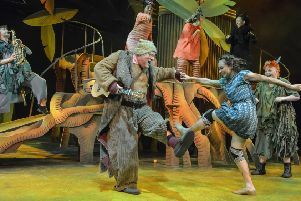 Following adaptations of Peppa Pig Live, Peppa Pig’s Party, Peppa Pig’s Treasure Hunt and Peppa’s Big Splash, Richard Lewis has once again done the adaption for this stage show. His other most recent productions include Octonauts Live and Ben & Holly’s Little Kingdom. Peppa Pig’s Surprise! is suitable for pre-school children aged 3 years and over. Tickets are priced £15 and £17 (family tickets and concessions available). Call 0114 249 6000 or visit www. (a transaction fee of £1.50 (£1.00 online) applies to all bookings made at the Box Office, excluding cash).